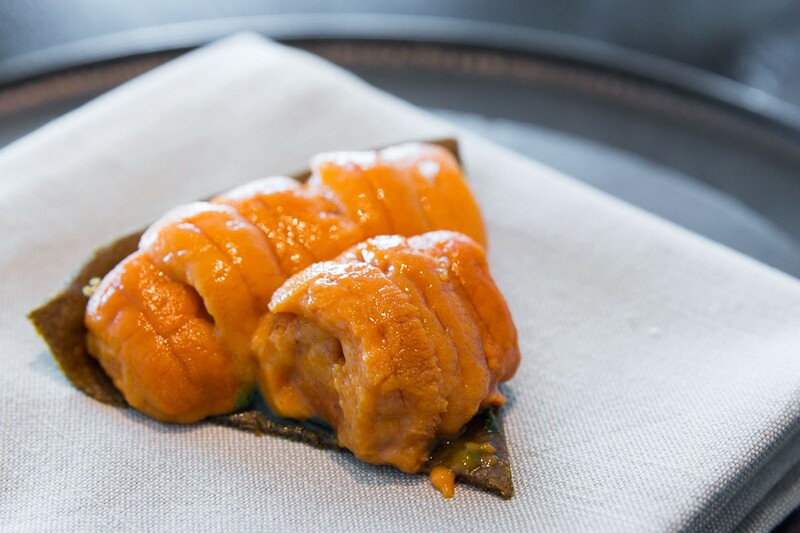 In January 2015, Noma, rated ‘Best Restaurant In The World’ by Restaurant Magazine opened a pop-up in Tokyo. Last year, I joined 60,000 other eager diners in a lottery for a reservation and lucked out. This was my experience. After months of anticipation, January 17 finally arrived. Traffic, exorbitant taxis and efficient trains make subways the best way to get around Tokyo. I headed to Mitsukoshimae station in Nihonbashi. 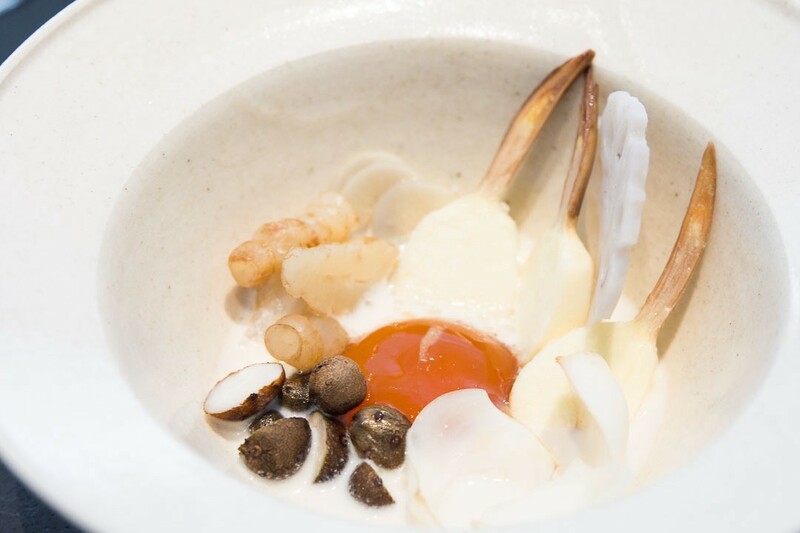 Chef Redzepi’s pop-up occupies the top floors of a tower in the heart of Tokyo. 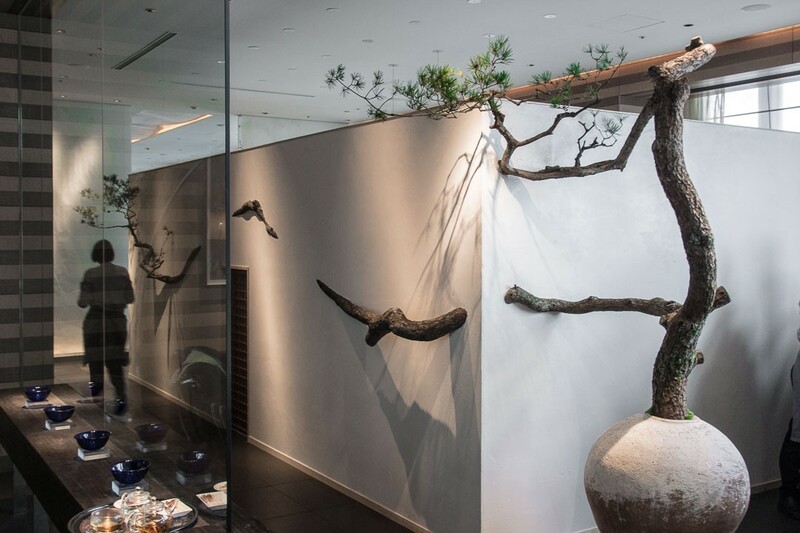 Located on the 37th floor, the entrance to Noma has a giant, living sculpture embedded into the wall. Fitting, given how the staff, space and food are so inextricably intertwined. Because the menu itself was expensive, I skipped the wine pairing when I reserved a table, but once I sat down, I couldn’t resist a glass of champagne. 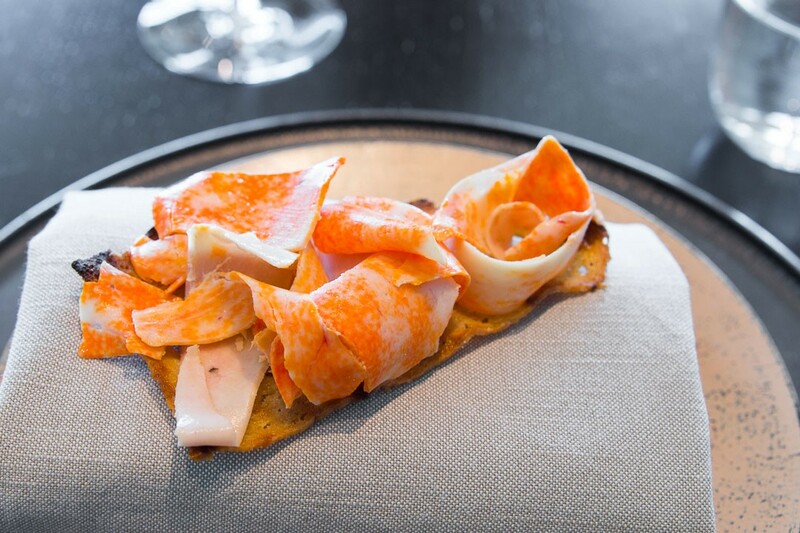 Chef Redzipi sourced 100 percent of his ingredients in Japan, but the wines were European. The first course was some fresh shimaebi from Hokkaido, and by fresh I mean my neighbor’s shrimp literally jumped off of his plate. Next up was a bowl of Japanese citrus in a konbu-infused oil with long pepper slices and sansho (japanese peppercorns). 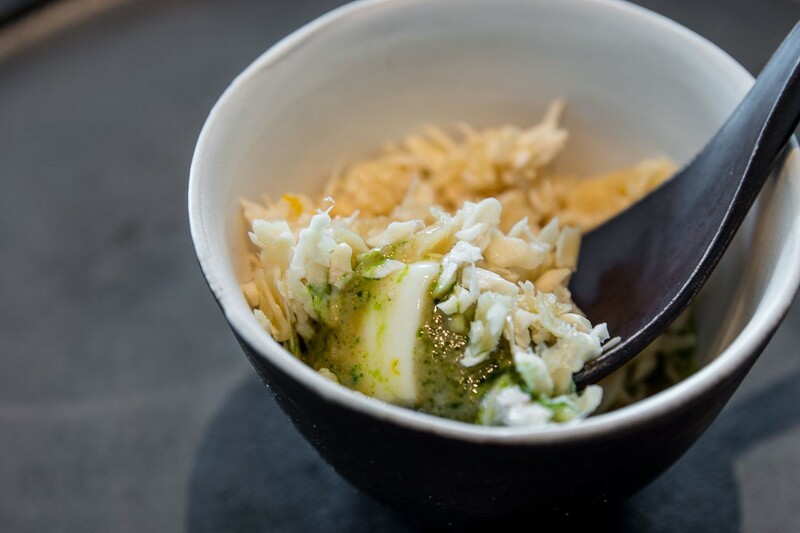 The shaved frozen monkfish liver was one of the best things I’ve ever put in my mouth. Melt-in-your-mouth creamy on a paper thin toast singed ever-so-slightly for a subtle bitter contrast to the unctuous Ankimo (monkfish liver). 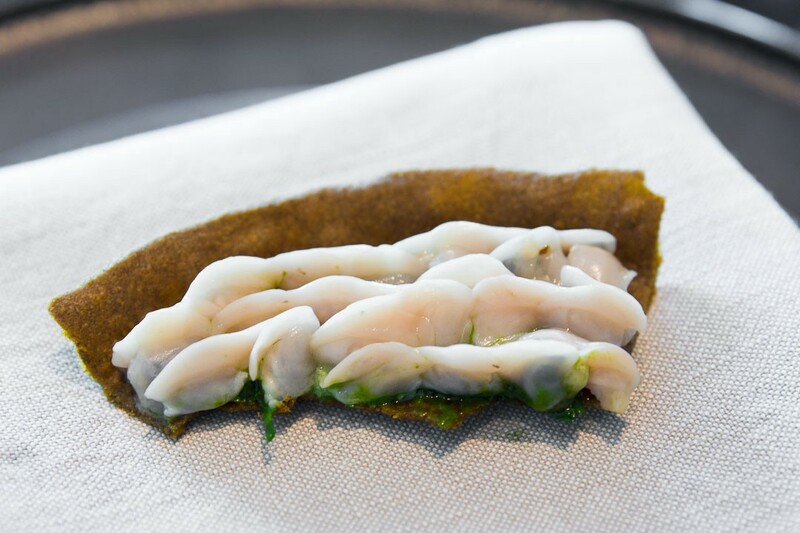 The next course was a Bafun uni tart on a razor thin konbu shell with parsley and kiwi-berry — sweet, briny, creamy and flowing with umami. We noticed the next table got a different tart and when we asked about it, we were offered their tart as well. This one was topped with freshwater Shijimi clams. 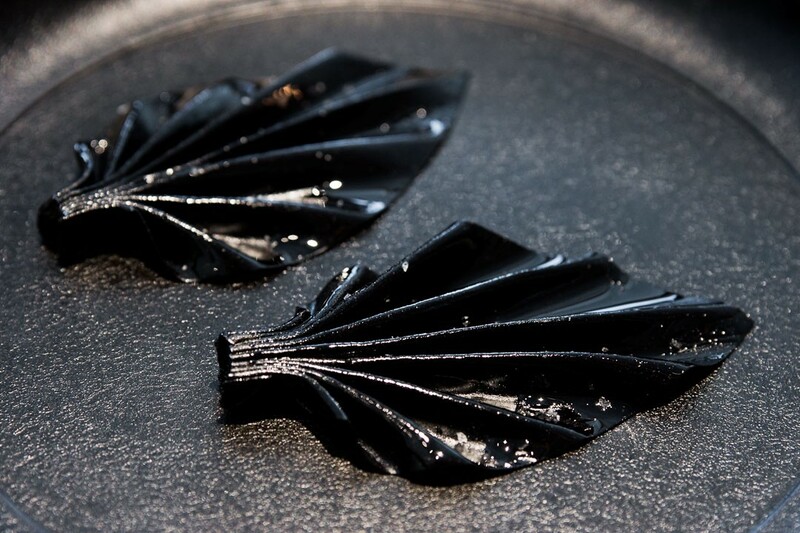 The lack of brine makes them sweet, blossoming into a crescendo of umami. Chef Redzipi also made his own tofu and miso. The tofu with yuzu miso and raw shaved walnuts was easily the best I’ve ever eaten. Next up was an aerated scallop fudge with beech nuts and konbu oil. 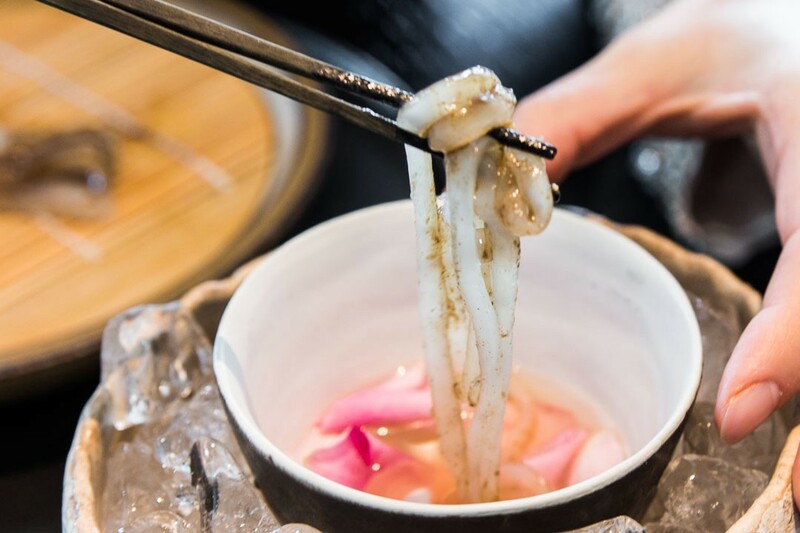 The bottom-most image above is a kouika (cuttlefish) “zaru soba” cured with kelp and served with a chilled pine needle and rose petal dashi. 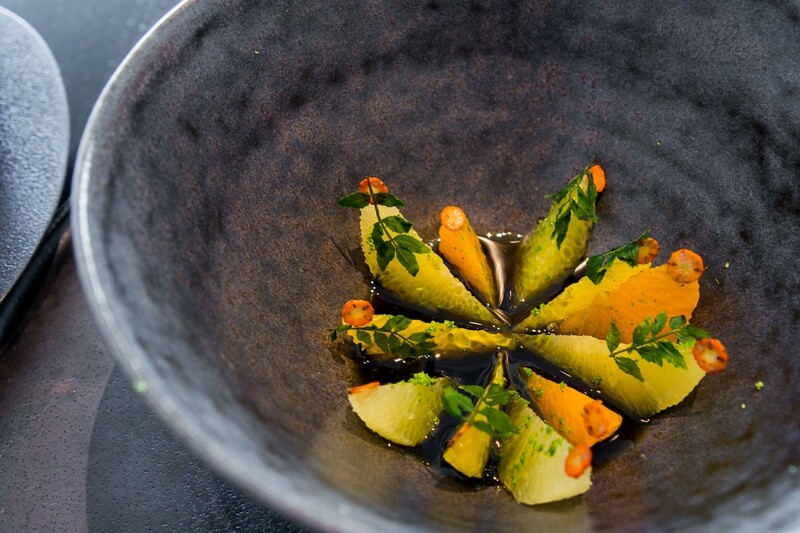 The top photo in the above collection is Hokkori kabocha in a raw peanut broth with cherrywood oil, accented with crispy salted cherry blossoms and konbu sticks. 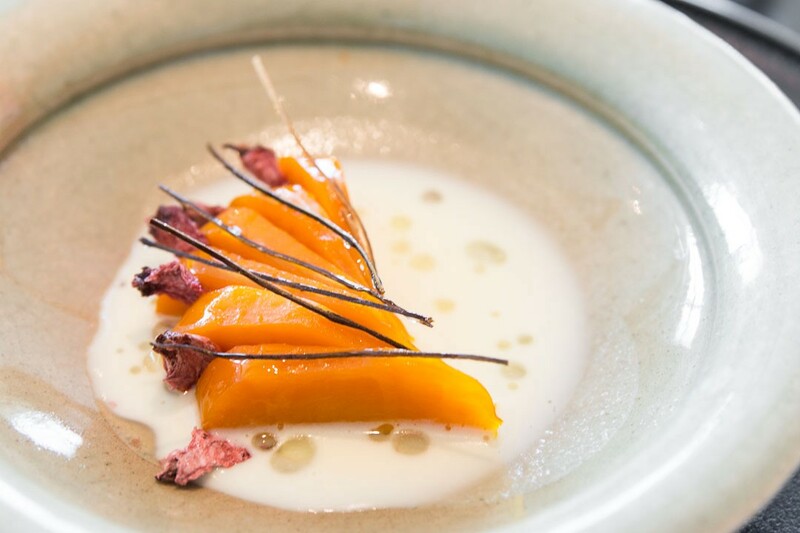 To the bottom right is a yolk cured on salted beef, surrounded by barely cooked Japanese root vegetables — a symphony of crispy textures. At left is black garlic leather, dusted with ant powder: chewy, sweet and unexpected. 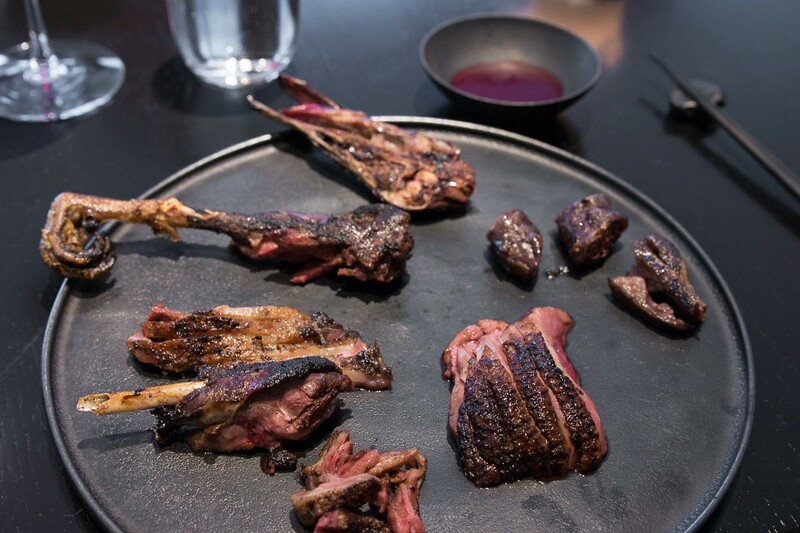 The wild roast duck, above left, was served with simple mountain grape puree, and had been aged for 24 days, rendering the tough bits edible and the meaty bits melt-in-your-mouth tender. 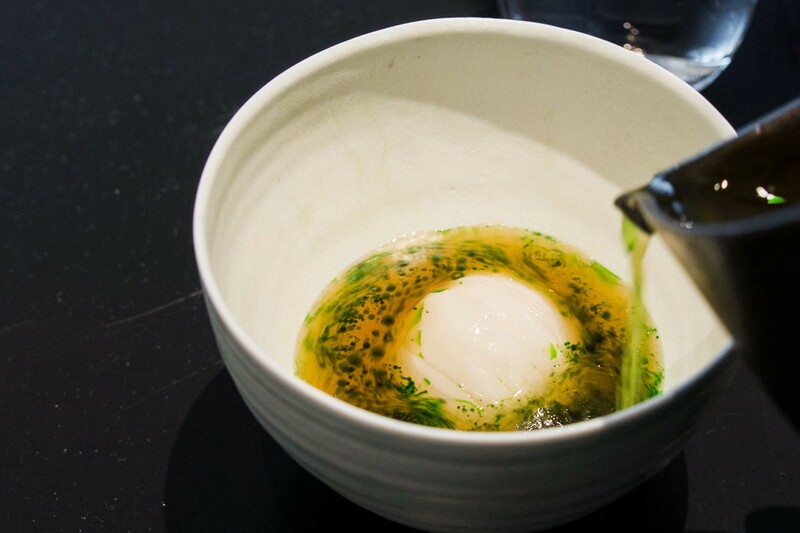 Following the duck was a poached turnip in a yeast broth with parsley oil. 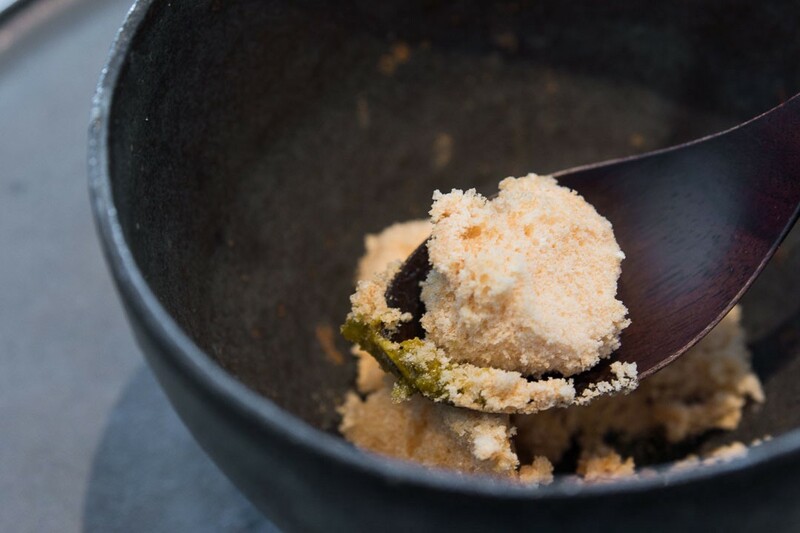 The amino acids in the yeast produced a full-flavored broth that was highlighted by the verdant oil. 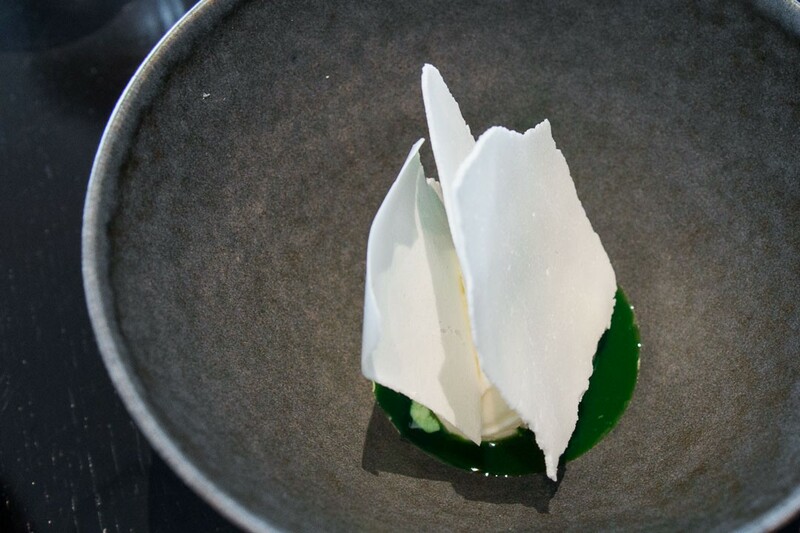 The first dessert was a sake kasu ice cream atop crunchy milk with crispy rice wafers, in a pool of sour sorrel. The next one, a roasted sweet potato, was roasted for a day and presented in a blistering hot clay pot with boiling caramel. Wrapping up the meal were fermented matsutake and shiitake mushrooms (above) coated in chocolate and served with foraged cinnamon roots from Kochi. 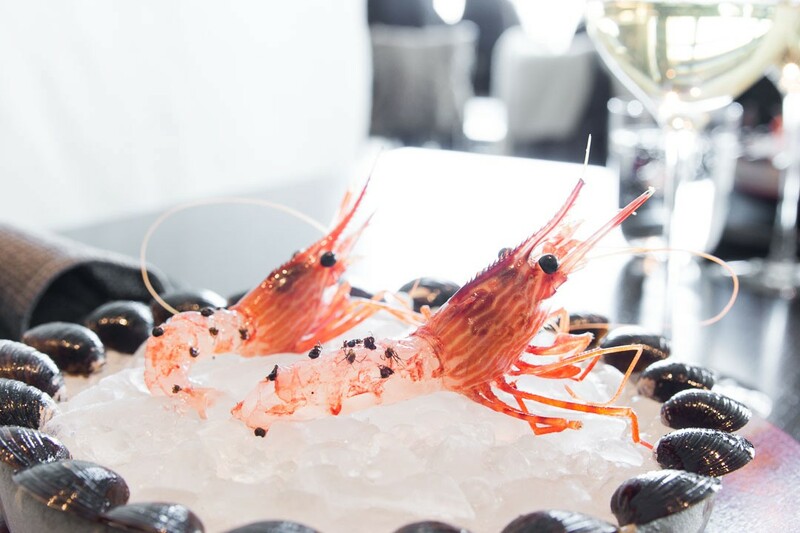 Is it the best restaurant in the world? Head to my site for more thoughts. Chef (https://norecipes.com ), writer (http://www.pbs.org/food/ ), personality (http://marcmatsumoto.com ). Join me on adventures both in & out of the kitchen!